Sunday, June 16, departing at 7:30am (7:00am from the subway). 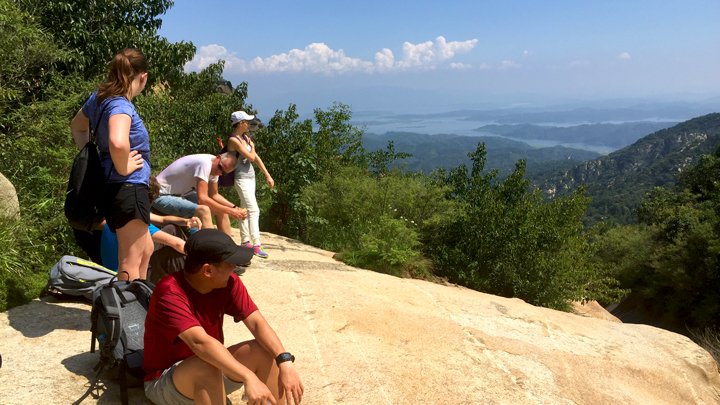 In Brief: Hike through and out of a park to reach a beautiful ridgeline trail with views of mountains and the Miyun Reservoir. Hikers on the way up the Immortal Valley park trails. 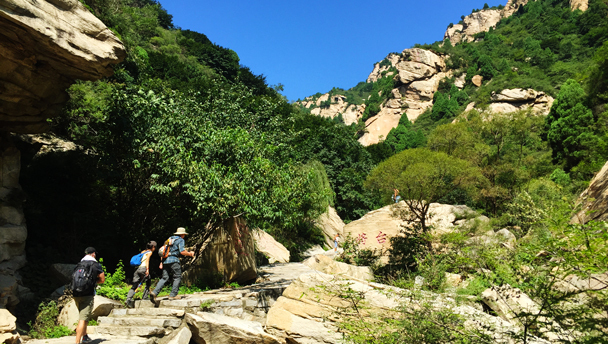 There’s a lot to see on our Immortal Valley Loop hike – many pools filled with clear spring water, waterfalls, big trees, wild flowers, some Great Wall, the Miyun Reservoir, and views of valleys and mountains. Regular hikers may have noticed we’re doing this hike a lot this year. That’s because it’s such a nice hike in the different seasons—on this visit the hills will be very green, and we may see the wildflowers blooming. The first section of the trail is through a park and is well shaded by leafy trees. A clear stream runs down through the valley, passing large granite boulders, forming natural pools, and flowing off cliffs in waterfalls that are up to twenty metres high. After about twenty minutes’ walk up the concrete park trail, we’ll reach the first of the big falls – fed by water from the small reservoir above, and used for ice climbing when it’s all frozen during winter. To get up to where the reservoir is, we climb a steel staircase that is fixed to the cliff face and will take us up to the reservoir above. From there we continue up Immortal Valley, passing pools of water and caves in the steep cliffs and heading for the shaded valley trail that will take us up to the top. 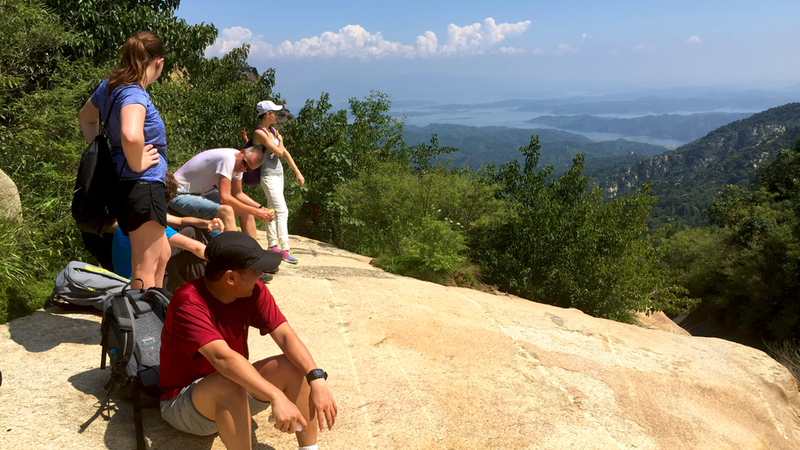 We’ll take a lunch break at the top, and will take our time to enjoy the views – a deep river valley on one side, the Miyun Reservoir on the other side, and mountains all around. The next part of the hike takes us down a different way, following a pretty path along and down a ridgeline, passing under huge bouldery cliffs and through copses of chestnut trees, pines, and wild apricots. Eventually we’ll join up again with the park trail used by regular visitors, and follow it back down to the carpark where we left our bus. In two places on the trail metal ladders are used to ascend cliff faces. They’ll be a little scary if you’re not good with heights! Take a look at photos from our visit to Immortal Valley. We did our Immortal Valley hike on a nice sunny day in April – click through to see some photos. We headed out to Immortal Valley, near the Miyun Reservoir, for a hike that took us past frozen pools and waterfalls and up to a ridgeline lookout. Click through for photos of frozen waterfalls, ice climbers, and blue skies.